Does that explain why older people need a nap at mid-morning and eat dinner at 4 pm? Or do they eat at 4 pm because it’s so enticingly cheap? You know, the whole early-bird special thing? (Hmmm, I’m thinking Shoney’s, Cracker Barrel, IHOP and — as they say down south — “All you can eat meat and three buffet,” which is Southern for as much as you can possibly eat of one choice of “meat” and three “side dishes.” Get it? Meat and Three. It’s kinda catchy don’t y’all think? This has now led to another random thought that’s rattling around my head that I can’t make go away — “Will I one day retire and move down to Del Ray Beach, Florida and live in one of those communities with names like ‘Dowager’s Hump Landing’ or ‘The Estates at’ Pine Box (Coming soon, see agent for details)? No, that’s wrong because I am a “goyim” and as such, would not be entirely welcome in Del Ray. I would have to move to Boynton Beach, where, as my ex-mother-in-law used to say, “that’s where the ‘goyim’ live.” In Boynton Beach, not only would I fit in, but I would be able to find communities with more “goy-centric” names that are more closely related to my Irish DNA, like, Irish Springs Estates, The Pines at Dublin, or The Gatehouses at Guinness. Anyway, so, now I’m thinking things like, will I be able to pull off wearing white, patent leather shoes in the winter and sandals with black socks against impossibly pale, white legs in the summer? Will I obey the community pool rules that insist that you must shower before entering the pool? And will people I don’t know yell at grandchildren of people I don’t know screaming things like “Can’t you read the sign! There is no horseplay or expectorating in or around the pool at any time!” Will I have my day disturbed by annoying public service announcements delivered by bored, impossibly good-looking young pool staffers shouting “Shuffleboard and Spin Class to the Oldies begin at 2 pm in the Lido Deck area! Don’t be tardy for the party!” Will I drive my obscenely large Buick in the left lane of I-95 at 50 miles per hour (with the top of my head barely cresting over the dashboard) causing everyone else to pass me on the right? Will I watch games shows and CNN for hours on end waiting until it’s time for the ‘meat and three buffet’ to open? Will I wear knee-high length socks to keep my legs out of view from the prying eyes of the desperate widows who seem to lurk around every corner? Sorry, it seems I’ve drifted off point with all this talk about Florida when I was supposed to be talking about my first intrusive thought of the day, which is that it’s starting to bother me that I’m getting up early every day, even though I still go to bed at midnight — the same time that I’ve always gone to bed. One negative thing about me getting up very early (I think) is that I’m in such a fog that I will usually have some random, thoroughly ridiculous thought “pop” into my head that keeps percolating throughout the day, building into a near obsession that I just can’t make go away. This morning at precisely 4:05 am, while drinking my first cup of coffee with a nice, delicious cigarette I was enjoying outside (I don’t smoke indoors), I had this disturbingly intrusive thought: Where the hell did ‘Nutella’ come from? How come I never saw or heard about it until just a few years ago? Experts attribute the lack of awareness of some things to “Bader-Meinhof Phenomenon (a phenomenon that occurs when something has been right there in front of you the whole time but you just never noticed it before). So how did it come to be that Nutella is now in your face at every imaginable place you go to buy food?” I mean, up until a few years ago, I had never heard the word, “Nutella” — even though it is a lot of fun to say. Nutella, Nutella, I’ll tell ya, Nutella! Good Fella, Nutella, You’re swella, Nutella. Don’t forget your Umbrella, Nutella. In fact, I love the word so much that I would consider legally changing my name to Nutella but I’m afraid people might shorten it to simply “Nut.” And I can’t have that, what with the whole thing about possibly moving to Florida and trying not to expectorate near or around the pool while wearing the knee-high-length socks that I discussed earlier! 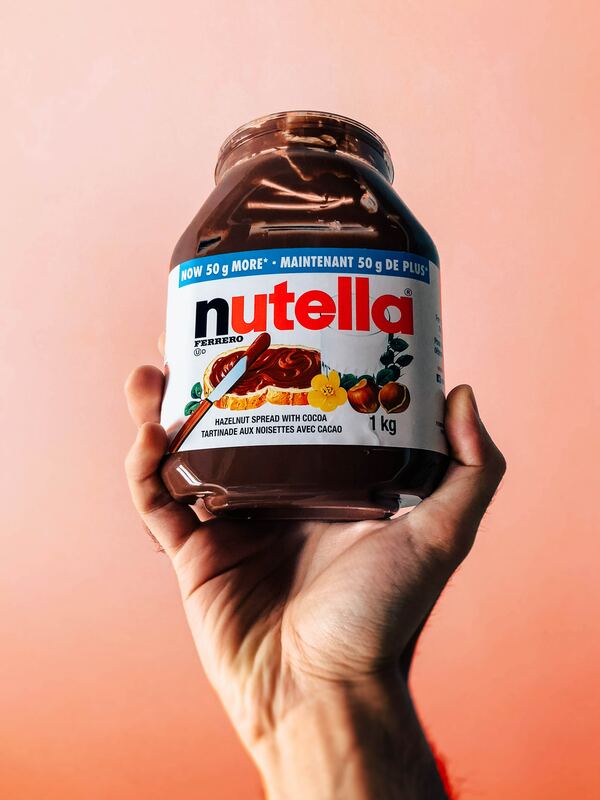 With the word Nutella firmly embedded in my head, and likely to stay there all day if I didn’t do something about it, I decided to do some research and write about it. So here goes. Nutella was invented in 1946 by Pietro Ferrero, a confectioner by trade who lived in a small town in Italy called “Alba” (no relation to Jessica Alba, who I’m disturbingly infatuated with). Apparently, chocolate was really scarce at that time so Pietro made a hazelnut paste and mixed it in with the chocolate (to make the limited cocoa go further/farther?) and molded it into a loaf that people could slice (think chocolate and hazelnut meatloaf) and then put on bread and eat it. It was an overnight success and soon became so popular that it came under the scrutiny of the French Government who, concerned about the amount of the palm oil used in the spread, and the adverse effects it might have on the health of the people of France, passed what became known as the “Nutella Tax.” There was such an outrage, and chaos over this, that a coalition (lobbyists?) was formed and senators from both the Communist and Conservative Parties came together and had the “Nutella Tax” repealed. (You know how the French are when it comes to food). Anyway, all was back to normal with the good people of France and throughout the whole of Europe where Nutella was — and still is — wildly popular. It wasn’t until 1999 that Nutella began advertising in the U.S. and within five short years, sales of the product tripled to more than $240 million in annual sales. Very quickly, the product gained a cult-like following among young Americans (millennials who are part of a unique and elite “foodie” culture who love the “cool european edge” Nutella has) and parents of young kids (who view it as a healthier choice than peanut butter). The product has become so popular here, that four years ago when the brand was celebrating its 50th Anniversary, Nutella-branded food trucks appeared in 16 regions throughout the country where consumers were bombarded by people (PR agency interns? Volunteers?) wearing Nutella T-Shirts while giving out stickers and coupons to enthusiastic passersby. The response from the peanut butter competition resulted in Jiff (#1 brand of PB in the U.S.) and Hershey, launching their own versions of the spread. No word on how that’s going yet as I got tired of researching so, if you really care about it, you can look it up yourself. Global annual sales of Nutella are now at more than 10.3 billion (euros), but insiders say the brand may be in danger of losing its edge due to over-commercialization, promotions that feel “forced” and “in-your-face” tactics that turn consumers off, which may cause an early end to America’s love affair with Nutella, and this product that was once happily spread on toast, may soon become “toast” itself.